Sharon graduated from Michigan State University with a degree in medical technology. Her passion has always been animals and she grandfathered in as an LVT in Michigan and eventually New York. She worked for many years at Briar Patch Veterinary Hospital and for the last 13 at Meadowridge Veterinary Hospital. Sharon also does behavioral consultations for pet owners- living with as many dogs and cats as she has a special interest in helping with behavioral problems. Sharon also has a small sheep farm that she keeps going by training herding dogs. She can be seen at her farm helping others with herding breeds pretty much every Sunday and she competes occasionally with one of her Border Collies. She also makes cheese at Snow Farm Creamery- they are her neighbors and it is great to spend time with them and creating excellent raw milk cheese from their cows. Sharon lives in a little log cabin wit her dogs and cats, and many other critters including alpacas and chickens. In the year plus she had worked for SOS she has only acquired a dog and a cat to add to her menagerie, which is amazing. 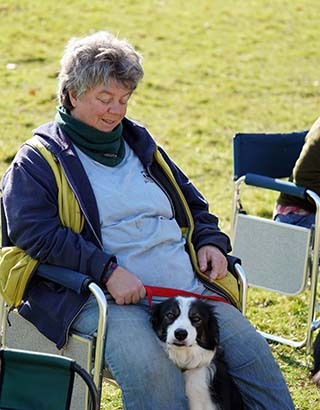 She can often be seen with her Katrina dog Millie at clinics- and if it’s not Millie it is one of her other dogs.